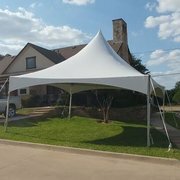 20 x 20 White Tent. Really Nice for Corporate Events. 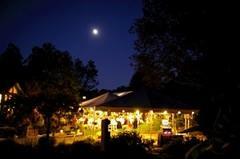 This tent can be Lighted for Evening Events. 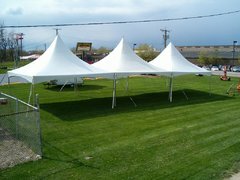 20x30 Frame Tent provides 600 sq. feet of space for your next outdoor event! 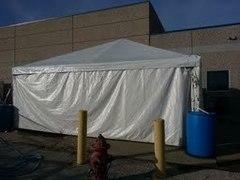 Beautiful 20 x 40 Tent for larger events. 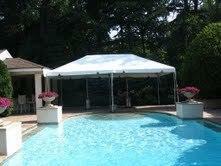 This tent looks great Lighted in the evenings. 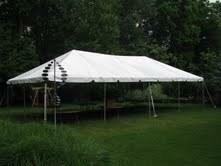 Great tent for up to 200 people. Seats people wth tables and chairs or cocktail tables for any event. Fans can have misters operating or not. Some municipalities require fire extinguishers for tents above a certain size. 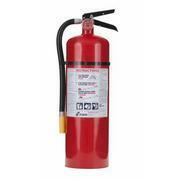 Please check with your city to see if your tent rental requires fire extinguishers. 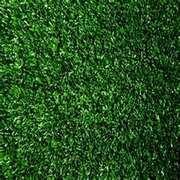 Used for weighting down canopies or bouncehouses. Must have a water source - barrels are delivered empty and filled up on site.